A contingent of indigenous leaders from around the world who visited for the International Union for the Conservation of Nature (IUCN) experienced first hand how Hawaiian Islands Land Trust (HILT), the Hau‘ula community, and others throughout Ko‘olauloa, O‘ahu are working together to conserve the ancient heiau, Maunawila. A specially invited group, primarily made up of indigenous peoples involved in Toby McLeod’s Standing on Sacred Ground documentary film series, was invited to visit Maunawila Heiau, acquired by HILT in 2014. These leaders were in Honolulu for the World Conservation Congress 2016 that took place in early September. They came from places as far away as Papua New Guinea, Mongolia, Baram River in Borneo, the Altai Republic of Russia, Kyrgyzstan, the Republic of Buryatia, Benin, Kenya, the U‘wa Nation, the Kichwa People of Sarayake and the Winnemem Wintu Tribe. 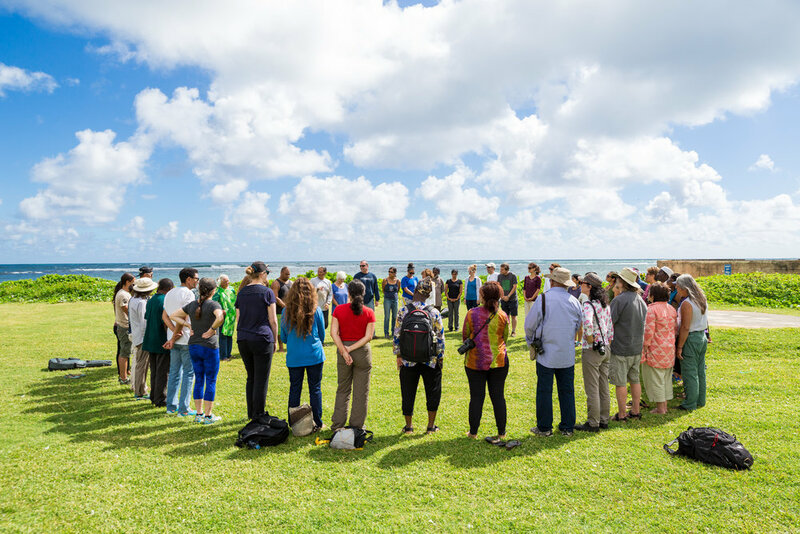 Over 50 people, including the international guests and members of the Ko‘olauloa community gathered together at the Hau‘ula Beach Park where HILT O‘ahu Island Director Tina Aiu began the protocol for entering the heiau. Davianna McGregor, a descendant of the former landowners of Maunawila, performed a pī kai (sprinkling salt water on everyone to cleanse them) and then the group headed to the property. Once gathered at the foot of the heiau, more protocol was done and gifts were offered, including oli and pule, or chant and prayers. Tēvita Ka‘ili and Rebekah Walker, professors of cultural anthropology at BYU Hawai‘i in Lā‘ie, gave the history of the heiau, beginning with mythological times up to their role today in helping to conserve and revitalize it. In addition to being able to partake in this experience with the amazing collection of indigenous leaders who came from all parts of the world, it was equally uplifting to be part of the community that came together to host the visitors. 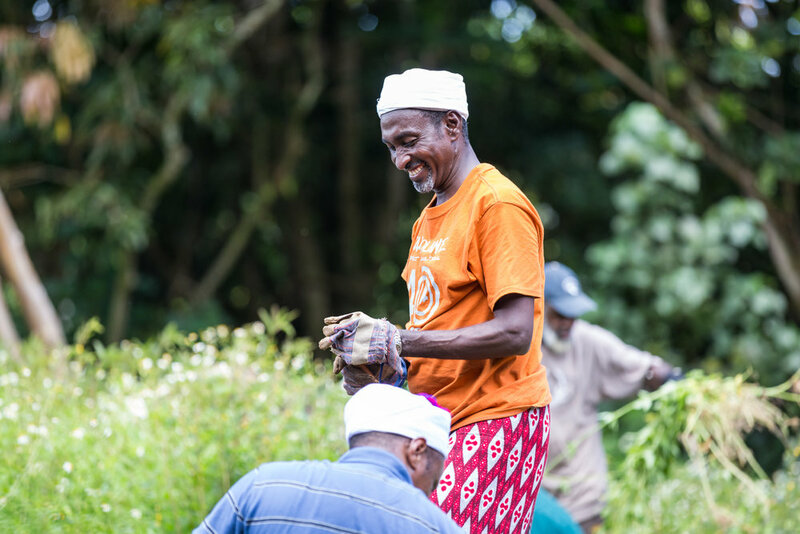 The Ko‘olauloa community, with representatives from Ka‘a‘awa to Lā‘ie, have embraced this kuleana, or responsibility to be stewards of the Maunawila Heiau. It is clearly a source of pride to the community. After Tēvita and Rebekah discussed a few noteworthy archaeological features on and around the heiau, both guests and community members donned gloves and gardening tools to pull weeds and help remove invasive plants. Everyone in this group understood what it means to mālama (care for) the land and felt at home with their hands in the earth. The visit was followed by a talk story session and a meal of traditional foods. On the way back to Honolulu, we stopped at Ka‘a‘awa, where our foreign guests seemed happy to have a chance to immerse themselves in the ocean. I, too, was proud, especially as a former landowner of Maunawila to be able to show our foreign guests a land conservation model for how a land trust can work together with a community to protect and preserve a sacred site. Tēvita posted on Facebook that “As a direct descendant of Tangaloa and Hina, it has been an honor for me to do conservation work at Maunawila Heiau.” Fran Palama, who has been a kahu for ceremonies at Maunawila, commented, “We were blessed, honored and privileged to form the circle of life and hope for our Mother Earth with the spiritual leaders from the IUCN in Hau‘ula.” Mahalo to HILT and to the Ko‘olauloa community for your ongoing commitment to protect our sacred sites. Mo‘olelo by Lurline McGregor. Photos: Courtesy of Michael Ogasawara. Newer PostRead our Fall 2016 Newsletter!